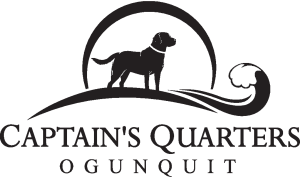 We specialize in vacationing with your dog in a welcoming clean environment. We accept all dogs, we do not limit size, and multiple dogs per room is fine. We do not accept Cats. All dogs are $5 per night, per dog. This is donated to our favorite animal shelters, and used as donations for any animal rescue fund raiser we are asked to sponsor. Year round convenient location at 483 Main Street centered between the village center and the Footbridge beach. Easy walk to town, beach, and restaurants. On the seasonal Ogunquit Trolley line. All rooms have maple hardwood floors. All suites have leather seating. Complimentary propane BBQ and patio area. Flat screen TV with DVD & cable. All rooms include Heat/AC, refrigerator, microwave, Keurig coffee maker. Nonsmoking, smoking is permitted 25 feet from any entrance per Maine state law. All rooms include top of the line Mattresses and luxury linens.